University of Oklahoma running back Joe Mixon has been named the Co-Big 12 Offensive Player of the Week after his all-around performance in OU's 66-59 road win over Texas Tech on Saturday in Lubbock. In a game that featured an NCAA-record 1,708 yards of combined total offense (854 by each team), Mixon shouldered most of the OU backfield load with fellow running back Samaje Perine out due to injury. Mixon accounted for 377 all-purpose yards, the most by an FBS player this season, the second most in OU history and the fourth most in Big 12 annals. The redshirt sophomore from Oakley, Calif., carried the ball 31 times for a career-high 263 yards (most by a Big 12 player this year and sixth most in school history; 8.5 average) and two touchdowns, and caught four passes for 114 yards (28.5 average) and three TDs. The three receiving scores set a record for an OU running back. Mixon is the only FBS player this year to score at least two rushing TDs and two receiving TDs in one game. In fact, since 1996, he is one of only two FBS players to register three receiving TDs and two rushing scores in one game. He also became the first player in OU history to log 200 yards rushing and 100 yards receiving in a contest. Only one other Sooner had ever registered 100-plus yards rushing and 100-plus yards receiving (Steve Sewell vs. Kansas State in 1984). 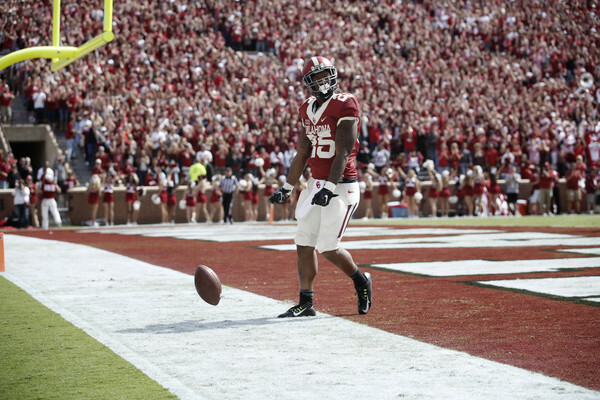 Mixon's five touchdowns against the Red Raiders stand as the most by a Big 12 player in a game this season. His scores came from an average of 40.4 yards. In order, he registered TDs of 56 yards (reception), 46 yards (rush), 43 yards (reception), 15 yards (reception) and 42 yards (rush). On the season, Mixon ranks second nationally with his 207.0 all-purpose yards per game. In Big 12 play, that league-leading number jumps to 226.0 per contest. Coupled with Dede's Westbrook's Big 12 Offensive Player of the Week honor on Oct. 10, this marks the fourth straight season OU has had multiple players win the award in the same year. It's also the ninth straight year an OU player has won the award at least twice in the same campaign. Mixon shared this week’s honor with Texas Tech quarterback Patrick Mahomes, who set an NCAA record with 819 yards of total offense. Oklahoma (5-2 overall, 4-0 Big 12) hosts Kansas (1-6, 0-4) on Saturday at 6 p.m. CT at Gaylord Family — Oklahoma Memorial Stadium. Tickets for the Homecoming game are available here and by calling the OU Athletics Ticket Office at 800-456-4668.